Read-out Instrumentation Signpost: Test kit for broadband. A complete package for control and acceptance measurements in FTTx and PON networks with wavelengths of 1310 nm, 1490 nm, 1550 nm, and 1625 nm is offered by Laser Components. Their FTTx measurement kit is specifically designed for companies involved in the broadband roll-out by Deutsche Telekom and has been listed in Zusätzlichen Technischen Vertragsbedingungen (ZTV-TKNetz 43). It contains both the ORL- 85 and the OLP-85 measuring instruments by Viavi Solutions, as well as all necessary patch cables and couplings. Designated Telekom installation companies receive this package at special rates! 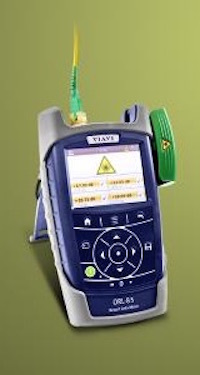 The ORL-85 includes an optical laser source, power meter, and return loss meter in one single device. The OLP-85 is a power meter with a measurement range from 800 nm to 1700 nm and an impressive dynamic range of 100 dB. The measurements can be performed both on the passive cable infrastructure (out of service) and on networks already in operation (in service). On an optional basis, both devices are available as a P version with an internal microscope for the end face inspection of optical connectors.